It’s that time of the week again for Destiny players as we look at Xur’s Location for Oct. 30-31 and what he’s selling this weekend. This weekend he’s hanging out in the tunnel that heads to the Vanguard trainers right across from Lord Shaxx. 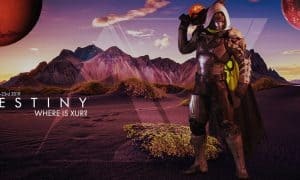 Xur has a number of different items we’ve not seen before, including the only current-content primary weapon with elemental damage. Let’s take a look at what the Agent of the Nine is packing this week. Titans who don’t have Truth, but love rocket launchers and want tracking will want to pick up this week’s Titan specific helmet. 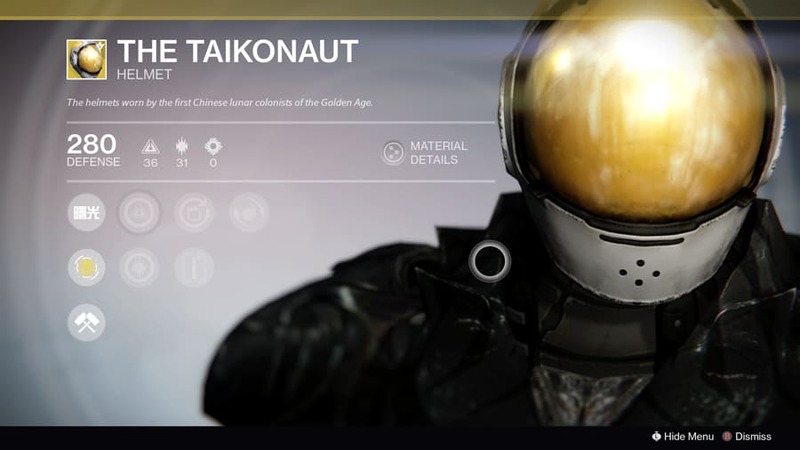 The Taikonaut helmet offers the Air Traffic Controller perk. The perk turns any rocket shot out of a rocket launcher into one that has tracking, meaning your rocket will follow the enemy you fired it at. As if that weren’t enough, Titans with this helmet will continue to have radar when zooming in with this weapon and will also see more heavy ammo drops. 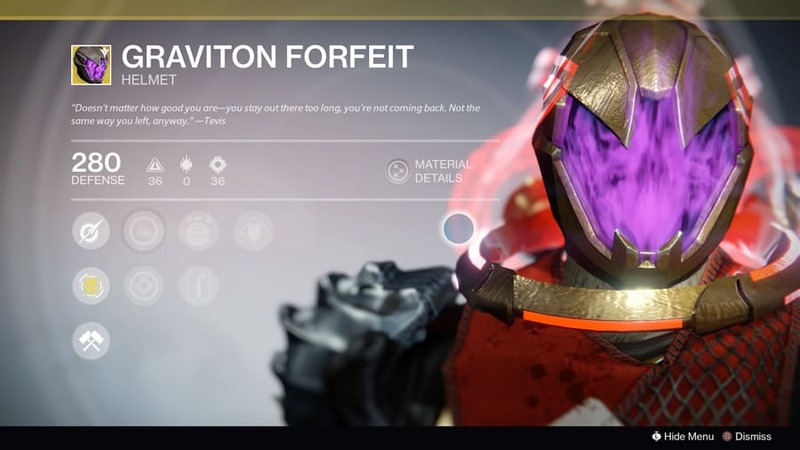 The Graviton Forfeit turns any Nightstalker Hunter into an acrobat of death. The helmet offers the Elusive Shadow perk that unlocks the subclass’ last passive tier ability Shade Step. Simply by pressing B+B on the Xbox One (O+O on PS4), you will disappear in a cloud of smoke while tumbling. 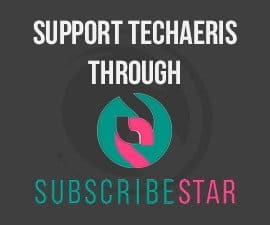 This is helpful in Crucible and various PvE situations. 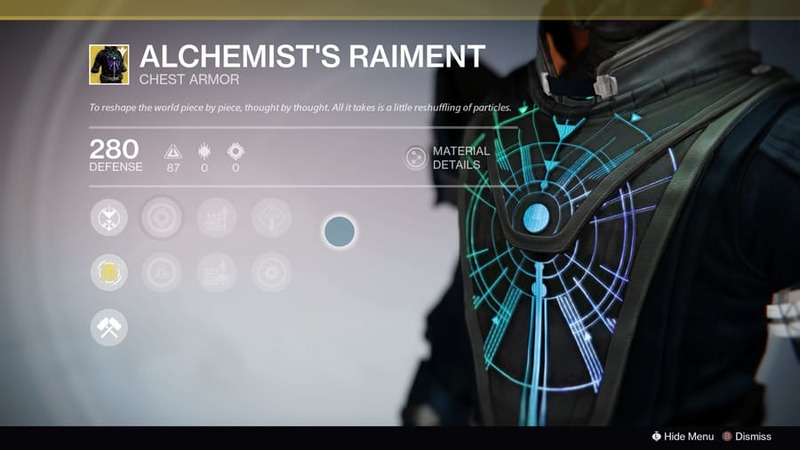 The Warlock chest piece the Alchemist’s Raiment, gives you the Iron to Gold perk. This perk gives you a small amount of glimmer on primary weapon ammo pickup. Not only that but when you pick up while your super meter is full, the orbs will recharge melee and grenade abilities. 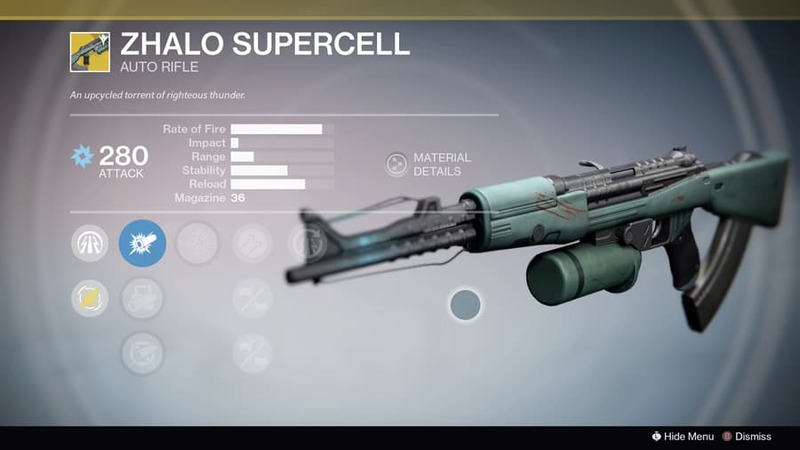 The only end-content primary weapon with elemental damage, the Zhalo Supercell is an auto rifle that fires off Arc elemental bullets. Coupled with weapon’s perk with the same name, the weapon has a chance to melt enemies quickly. The Zhalo Supercell perk will have a chance to chain lightning when enemies are close together. 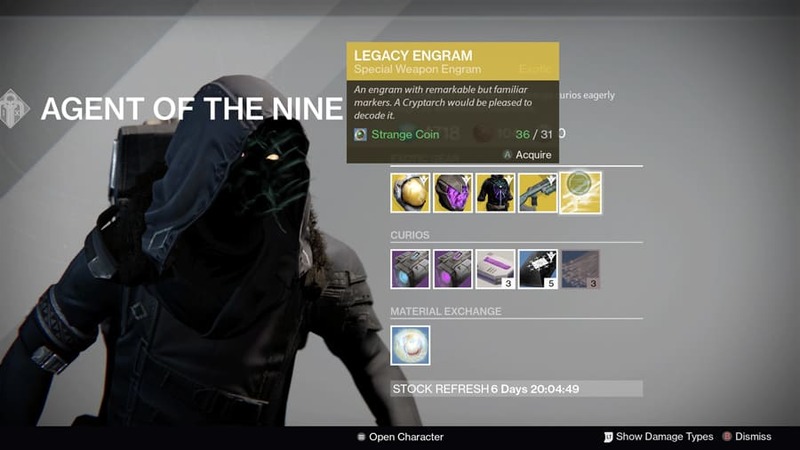 After having the heavy weapon legacy engram for a few weeks, Xur has finally brought us a new engram to choose from. This week we’re seeing a year one legacy engram for special weapons, meaning if you have yet to get an Icebreaker to drop, now’s your chance. This week, Xur has brought the Plasma (Blue) and Void (Purple) drives to turn that rare sparrow into a legendary one. You can grab them for 23 Strange Coins each. Also in his wares are heavy ammo synths for one Strange Coin each. He also has the usual Three of Coins for seven Strange Coins each and the Glass Needles for three Strange Coins plus three Motes of Light and one Exotic Shard. If you’re low on Motes of Light, you can exchange two Strange Coins for one Mote. Xur will only be here until 1 a.m. PST (4 a.m EST), so you’d better check his wares before he’s gone. 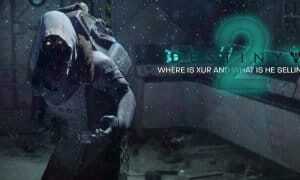 Also, you may want to be mindful of the end of Daylight Savings Time and how that may affect Xur’s departure.